A pulse oximeter is the most important monitoring tool in modern anaesthesia practice. It is a non-invasive medical device that checks the level of oxygen in a patient’s bloodstream and sounds an alarm as soon as it detects the slightest unsafe change. Though they became widespread in the 1980s, oxygen monitors have historical precedence: an 18th century principle known as Beer’s Law, which found that different frequencies of light are absorbed in different volumes. A small probe, attached to a separate computerized unit, is clipped to a spot on the body with good blood flow – typically the finger or the earlobe. Inside the probe is a light emitter that sends out two streams of light: one red and one infrared. Opposite the emitter is a photodetector which receives and measures these streams of light as they pass through. Oxygenated haemoglobin absorbs a greater amount of infrared light while allowing more red light to pass through. Deoxygenated haemoglobin absorbs a greater amount of red light while allowing more infrared light to pass through. By calculating the absorption by haemoglobin in the patient’s blood stream at these two different wavelengths, the oximeter can calculate the level of oxygenation present. The oximeter sounds a warning alarm as soon as it detects any change in the level of oxygen of patients under anaesthesia. Brain damage and heart failure can occur after as little as three minutes of oxygen starvation, and so early detection is critical. A healthy body should never fall below 95% oxygen saturation. Oximeters can detect changes as small as 1%. Before oximeters, clinicians would only notice signs of hypoxia (oxygen starvation) when patients’ skin literally began turning blue, with oxygen saturation at about 85%. Pulse oximeters were rapidly adopted by anaesthesiologists as the universal standard of care in operating theatres, emergency, recovery and neonatal units and all wards (especially in paediatric wards). Oximeters are used in the treatment of pneumonia; they can be used to prevent neonatal blindness – they are a key component of the WHO Safe Surgery Checklist. They are a vital piece of hospital equipment, which remains worryingly scarce in low-resource countries. 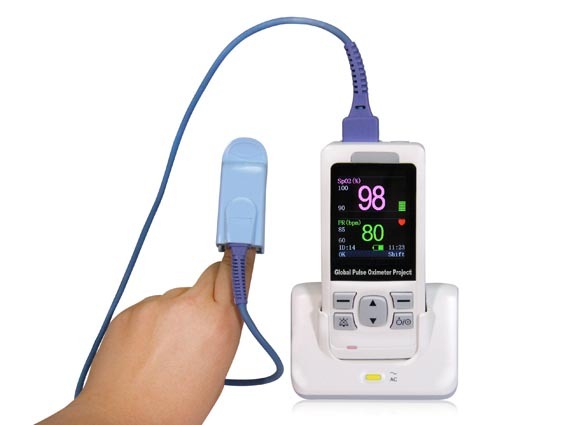 Click here to download specifications of the pulse oximeter supplied through Lifebox®.